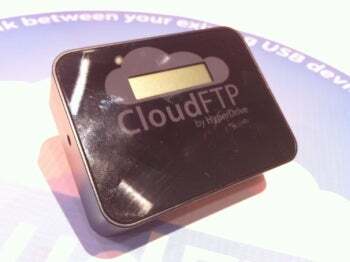 CloudFTP is a $100 gadget that addresses one of the most ubiquitous tech disconnects in recent memory: the lack of USB support on iPhones and iPads, which makes it a hassle to transfer data from a thumb drive to these popular devices. Sure, you can use a PC as intermediary, but hooking up your iOS device just to transfer a few files seems like a lot of work for a pretty routine task--and a computer isn't always handy when you need one. CloudFTP is small enough to carry in your pocket, and it's a stand-alone solution that requires no additional hardware or network support. You start by plugging the USB drive into the device. CloudFTP's USB port is powered, so it can access any USB mass storage device. CloudFTP by default creates its own ad-hoc Wi-Fi network, so to access the data on the drive you simply join that network with your iOS device (or any other Wi-Fi enabled device). Now you can access the data on the USB drive, either by running an HTML5 Web app, a dedicated iOS or Android app, or a standard FTP client. You can also connect CloudFTP to an existing Wi-Fi network, where it is accessible to other devices on the network. In this mode, it can use the network's Internet connection to back up the data on the USB drive to cloud services such as iCloud, Dropbox or Box.net. Powering the CloudFTP is an internal rechargeable battery that, according to developer Daniel Chin, will last for five hours between charges. The story of CloudFTP's development is as interesting as the device itself. Chin sought $100,000 in funding on Kickstarter--a site where entrepreneurs can seek financing for projects from grassroots investors--and at this writing had attracted more than $260,000 from more than 2700 individuals, who will get the first production units. CloudFTP is for sale on its Kickstarter site, which says the investors will get their units in February.